The search for the fabled Northwest Passage had cost the lives of many European explorer whose ships became frozen and crushed by the bitter Arctic ice. Now with climate change, it seems sailing the passage through the Arctic archipelago will become a pleasant cruise aboard a luxury liner. 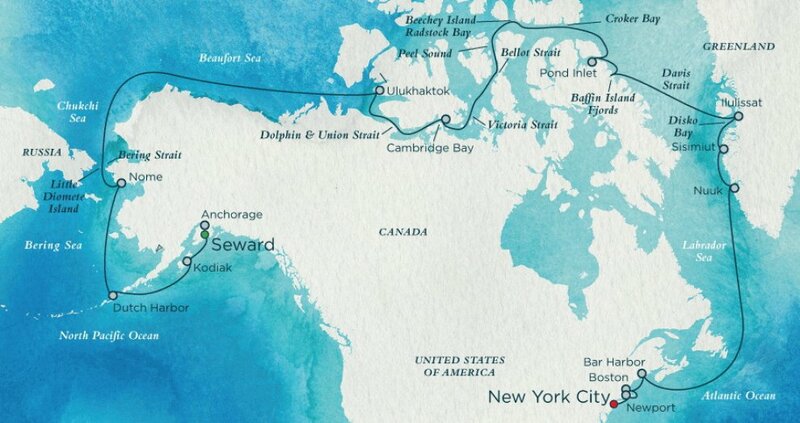 The liner Crystal Serenity is en route, having set off on August 16th from Alaska and is now about mid-point in the trip. Experts have continually pointed out the potential dangers should there be an accident: this means in terms of rescue, or environmental damage. Nonetheless, the Nunavut Impact Review Board (NIRB) has recommended to the federal government to approve the voyage without a full environmental review. Responding to Crystal Cruises submission for the trip, the NIRB said the voyage this year, and another planned for 2017, “is unlikely to have significant adverse environmental and social impacts” according to a 29-page screening decision the board released on Aug. 23. In terms of safety and environment the ship will have certain rules to follow such as staying away from any swimming bears. The company has also contracted an ice-breaking safety vessel with helicopters and emergency supplies chartered from the the British Antarctic Survey to accompany the huge liner. The ship will also be burning a low-sulphur fuel to reduce pollution. Elena Agarkova, senior program officer for the World Wildlife Fund noted the cruise had taken a number of safety and environmental measures. Quoted in CTV News however, she said, “Cruise ships of the size of the Crystal Serenity are essentially huge cities. They are going to have some 1,700 passengers, including crew, on board and they are going to be discharging thousands of gallons of sewage and greywater as they sail through the Arctic waters.” She said although the waste will be dumped at least 12 nautical miles from shore, it will still be going into the Arctic ecosystem on a daily basis. Robert Papp, a former Coast Guard commandant who’s now U.S. Special Representative for the Arctic, also expressed some concerns about preparations in a worst-case scenario, questioning the preparations and ability to react to an accident with a ship this size and over 1,500 passengers and crew. That’s also a concern for noted Arctic researcher and author Micheal Byers, Canada Research Chair in Global Politics and International Law at the University of British Columbia and the author of International Law and the Arctic. He adds the ships put a strain on local governments and services and don’t contribute much economic benefit to the communities they visit. For the some 900 or more passengers, the trip isn’t cheap, starting at over $21,000 US and going up to $120,000. Add to that, compulsory medical insurance which must include emergency evacuation coverage of $50,000. In spite of that, the cruise sold out in less than a month.